Location: Spinal column at the level of the navel, in the region of the solar plexus. Nabhi is represented inside the Void area. Vibrations: Nabhi vibrations are felt in the middle fingers. Associated Element: Nabhi is aligned with the essential element of water. Associated Color: Green. May symbolically represent the element of water, essential to the origin and sustenance of life, from the emergence of microscopic life forms to the evolution of more complex forms of life.Physiology/physical regions governed: Nabhi’s primary physiological function is governing the stomach/digestive processes. Left Nabhi governs functioning of the pancreas and spleen; center Nabhi. stomach and intestines; right Nabhi, liver and gall bladder. Nabhi drives the evolutionary process within us. 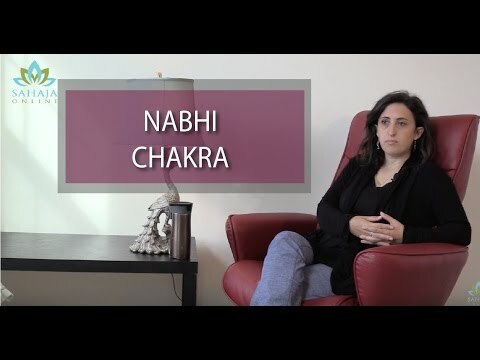 The fundamental qualities of the Nabhi chakra are generosity, satisfaction, and the drive and capacity to evolve. Nabhi is associated with the pursuit of spirituality, for it is from Nabhi that we receive the strong “seeking” urge… the urge to seek the subtler things in life, the urge to discover the higher purpose and meaning of the universe and our place in it, and the urge to continue evolving to higher states of consciousness. Through Nabhi, our minds are opened to new possibilities. Nabhi represents the “seeking” urge within us, which may be directed toward different goals at different times. At the most basic level, we seek food, water, shelter, and security, then we progressively climb to higher forms of seeking behavior, such as quests for wealth, affluence and power. Ultimately, we pursue the higher, subtler aspects of existence: self-actualization, self-realization and spiritual truth. Satisfaction is another key Nabhi quality. It is through this chakra that we can establish perfect balance between family, work, leisure and spiritual activities and are able to clearly see the essence and role of each. 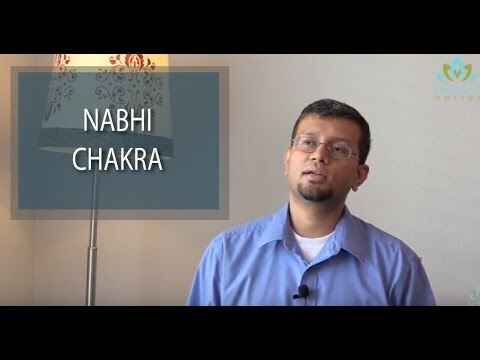 A strong Nabhi chakra the qualities of love, nurture and affection in women, specifically, improving their ability to take good care of their families. Nabhi even strengthens our ability to accept responsibilities and even begin to enjoy the duties we must take on. We come to understand that the family, a cornerstone of society, must be supported and that it will only flourish in an atmosphere of love, respect and unity. Energizing the Nabhi chakra purifies our attention, so that it becomes a clear, direct path to higher states of consciousness. Nabhi gives us the capacity to lead a life of righteousness. Through Nabhi, we develop a deeper sense of caring. We become more sensitive to others. Our sense of moral responsibility increases and our value judgments improve. Discerning right from wrong becomes easier and more intuitive. A strengthened Nabhi increases our innate sense of generosity. We no longer cling to our possessions and we are able to truly experience the joy of giving. When we share, we learn. Nabhi teaches us that being generous is elevating and growth-oriented, whereas hoarding can lead to stagnation — a blocked, immature psyche. Such an individual can have a negative influence on society since, after all, the qualities of selfishness and greed have been known cause many a worldwide crisis and can certainly trigger discontent and dissatisfaction in the lives they touch. Our spiritual growth relies on our contentment, and our contentment depends on our Nabhi-ness — our openness and generosity. When we share, we reap the fruits of our generosity, which, in turn, nourishes the Nabhi chakra. Nabhi drives the evolutionary process within us. The fundamental qualities of the Nabhi chakra are generosity, satisfaction, and the drive and capacity to evolve. Nabhi is the center of our welfare, both physical and financial. Prosperity is a necessary step in our evolution, and money exists to help us fulfill our basic needs and desires. We hone our talents and earn money to fulfill our needs, but once our essential needs are satisfied, we should no longer be preoccupied with money. The desire to obtain money for money’s sake tends to transform into greed. Over time, we may develop an unquenchable desire for “things,” which can lead to an unfulfilling, overly-materialistic existence. If we become obsessed with amassing wealth for wealth’s sake, our growth is impeded, and longer-term, our levels of satisfaction, for we will still always be seeking something greater that money cannot buy. Once we are no longer obsessed with accumulating (and hoarding) money, we are able to enjoy the rewards of sharing. The satisfaction and contentedness that Nabhi brings means that you stop feeling constantly pressured to “achieve” (especially outward symbols of material wealth) — you’re no longer “desperately wanting” anything. More and more, your ambitions may become self-transcendent, tilted more toward the pursuit of causes outside your own skin, as Abraham Maslow put it, rather than pursuits driven by ego (your own, or that of others, such as your boss). A strong, long-term Nabhi connection brings about an unusually high degree of satisfaction from within. You stop chasing external symbols of wealth or status that have no relevance to your spiritual evolution. After Self-Realization, your attitudes toward food may change; for example, you may stop craving certain foods and start enjoying foods you never liked before. Over time, you’ll likely develop a more subtle and detached attitude about food and satiety; for example, you may find that you experience the same amount of satisfaction from a simple meal as you do from the finest cuisine.